Flaps are a kind of high-lift device used to increase the lift of an aircraft wing at a given airspeed. Flaps are usually mounted on the wing trailing edges of a fixed-wing aircraft. Flaps are used for extra lift on takeoff. Flaps also cause an increase in drag in mid-flight, so they are retracted when not needed. Extending the wing flaps increases the camber or curvature of the wing, raising the maximum lift coefficient or the upper limit to the lift a wing can generate. This allows the aircraft to generate the required lift at a lower speed, reducing the stalling speed of the aircraft, and therefore also the minimum speed at which the aircraft will safely maintain flight. The increase in camber also increases the wing drag, which can be beneficial during approach and landing, because it slows the aircraft. In some aircraft configurations, a useful side effect of flap deployment is a decrease in aircraft pitch angle, which lowers the nose thereby improving the pilot's view of the runway over the nose of the aircraft during landing. In other configurations, however, depending on the type of flap and the location of the wing, flaps can cause the nose to rise (pitch-up), obscuring the pilot's view of the runway. There are many different designs of flaps used, with the specific choice depending on the size, speed and complexity of the aircraft on which they are to be used, as well as the era in which the aircraft was designed. Plain flaps, slotted flaps, and Fowler flaps are the most common. Krueger flaps are positioned on the leading edge of the wings and are used on many jet airliners. The Fowler, Fairey-Youngman and Gouge types of flap increase the wing area in addition to changing the camber. The larger lifting surface reduces wing loading, hence further reducing the stalling speed. Some flaps are fitted elsewhere. Leading-edge flaps form the wing leading edge and when deployed they rotate down to increase the wing camber. The de Havilland DH.88 Comet racer had flaps running beneath the fuselage and forward of the wing trailing edge. Many of the Waco Custom Cabin series biplanes have the flaps at mid-chord on the underside of the top wing. is the lift coefficient, which is determined by the shape of the airfoil used and the angle at which the wing meets the air (or angle of attack).
) allow a similar amount of lift to be generated at a lower airspeed (V). Extending the flaps also increases the drag coefficient of the aircraft. Therefore, for any given weight and airspeed, flaps increase the drag force. Flaps increase the drag coefficient of an aircraft due to higher induced drag caused by the distorted spanwise lift distribution on the wing with flaps extended. Some flaps increase the wing area and, for any given speed, this also increases the parasitic drag component of total drag. Depending on the aircraft type, flaps may be partially extended for takeoff. When used during takeoff, flaps trade runway distance for climb rate: using flaps reduces ground roll but also reduces the climb rate. The amount of flap used on takeoff is specific to each type of aircraft, and the manufacturer will suggest limits and may indicate the reduction in climb rate to be expected. The Cessna 172S Pilot Operating Handbook generally recommends 10° of flaps on takeoff, especially when the ground is rough or soft. Flaps may be fully extended for landing to give the aircraft a lower stall speed so the approach to landing can be flown more slowly, which also allows the aircraft to land in a shorter distance. The higher lift and drag associated with fully extended flaps allows a steeper and slower approach to the landing site, but imposes handling difficulties in aircraft with very low wing loading (i.e. having little weight and a large wing area). Winds across the line of flight, known as crosswinds, cause the windward side of the aircraft to generate more lift and drag, causing the aircraft to roll, yaw and pitch off its intended flight path, and as a result many light aircraft land with reduced flap settings in crosswinds. Furthermore, once the aircraft is on the ground, the flaps may decrease the effectiveness of the brakes since the wing is still generating lift and preventing the entire weight of the aircraft from resting on the tires, thus increasing stopping distance, particularly in wet or icy conditions. Usually, the pilot will raise the flaps as soon as possible to prevent this from occurring. Some gliders not only use flaps when landing, but also in flight to optimize the camber of the wing for the chosen speed. While thermalling, flaps may be partially extended to reduce the stall speed so that the glider can be flown more slowly and thereby reduce the rate of sink, which lets the glider use the rising air of the thermal more efficiently, and to turn in a smaller circle to make best use of the core of the thermal. At higher speeds a negative flap setting is used to reduce the nose-down pitching moment. This reduces the balancing load required on the horizontal stabilizer, which in turn reduces the trim drag associated with keeping the glider in longitudinal trim. Negative flap may also be used during the initial stage of an aerotow launch and at the end of the landing run in order to maintain better control by the ailerons. Like gliders, some fighters such as the Nakajima Ki-43 also use special flaps to improve maneuverability during air combat, allowing the fighter to create more lift at a given speed, allowing for much tighter turns. The flaps used for this must be designed specifically to handle the greater stresses and most flaps have a maximum speed at which they can be deployed. Control line model aircraft built for precision aerobatics competition usually have a type of maneuvering flap system that moves them in an opposing direction to the elevators, to assist in tightening the radius of a maneuver. Extending flaps often run on guide tracks. Where these run outside the wing structure they may be faired in to streamline them and protect them from damage. Some track fairings are designed to act as anti-shock bodies, which reduce drag caused by local sonic shock waves where the airflow becomes transonic at high speeds. Thrust gates, or gaps, in the trailing edge flaps may be required to minimise interference between the engine flow and deployed flaps. In the absence of an inboard aileron, which provides a gap in many flap installations, a modified flap section may be needed. The thrust gate on the Boeing 757 was provided by a single-slotted flap in between the inboard and outboard double-slotted flaps. The A320, A330, A340 and A380 have no inboard aileron. No thrust gate is required in the continuous, single-slotted flap. Interference in the go-around case while the flaps are still fully deployed can cause increased drag which must not compromise the climb gradient. Flaps and high lift devices. Gurney flap exaggerated for clarity. Blown flap skipped as it is modified from any other type. Pale lines indicate line of movement, and green indicates flap setting used during dive. The rear portion of airfoil rotates downwards on a simple hinge mounted at the front of the flap. The Royal Aircraft Factory and National Physical Laboratory in the United Kingdom tested flaps in 1913 and 1914, but these were never installed in an actual aircraft. In 1916, the Fairey Aviation Company made a number of improvements to a Sopwith Baby they were rebuilding, including their Patent Camber Changing Gear, making the Fairey Hamble Baby as they renamed it, the first aircraft to fly with flaps. These were full span plain flaps which incorporated ailerons, making it also the first instance of flaperons. Fairey were not alone however, as Breguet soon incorporated automatic flaps into the lower wing of their Breguet 14 reconnaissance/bomber in 1917. Due to the greater efficiency of other flap types, the plain flap is normally only used where simplicity is required. "Split flap" redirects here. For the display type, see Split-flap display. The rear portion of the lower surface of the airfoil hinges downwards from the leading edge of the flap, while the upper surface stays immobile. This can cause large changes in longitudinal trim, pitching the nose either down or up. At full deflection, a split flaps acts much like a spoiler, adding significantly to drag coefficient. It also adds a little to lift coefficient. It was invented by Orville Wright and James M. H. Jacobs in 1920, but only became common in the 1930s and was then quickly superseded. The Douglas DC-1 (progenitor to the DC-3 and C-47) was one of the first of many aircraft types to use split flaps. A gap between the flap and the wing forces high pressure air from below the wing over the flap helping the airflow remain attached to the flap, increasing lift compared to a split flap. Additionally, lift across the entire chord of the primary airfoil is greatly increased as the velocity of air leaving its trailing edge is raised, from the typical non-flap 80% of freestream, to that of the higher-speed, lower-pressure air flowing around the leading edge of the slotted flap. Any flap that allows air to pass between the wing and the flap is considered a slotted flap. The slotted flap was a result of research at Handley-Page, a variant of the slot that dates from the 1920s, but wasn't widely used until much later. Some flaps use multiple slots to further boost the effect. A split flap that slides backwards, before hinging downward, thereby increasing first chord, then camber. The flap may form part of the upper surface of the wing, like a plain flap, or it may not, like a split flap, but it must slide rearward before lowering. As a defining feature – distinguishing it from the Gouge Flap – it always provides a slot effect. Invented by Harlan D. Fowler in 1924, and tested by Fred Weick at NACA in 1932. They were first used on the Martin 146 prototype in 1935, and in production on the 1937 Lockheed Super Electra, and are still in widespread use on modern aircraft, often with multiple slots. A slotted plain flap where the flap is fixed below the trailing edge of the wing, rotating about its forward edge, and usually forming the "inboard" hinged section (closer to the root) of the Junkers Doppelflügel, or "double-wing" style of wing trailing edge control surfaces (including the outboard-mounted ailerons), which hung just below and behind the wing's fixed trailing edge. When not in use, it has more drag than other types, but is more effective at creating additional lift than a plain or split flap, while retaining their mechanical simplicity. Invented by Otto Mader at Junkers in the late 1920s, they were most often seen on the Junkers Ju 52 and the Junkers Ju 87 Stuka dive bomber, though the same wing control surface can be also be found on many modern ultralights, like the Denney Kitfox. A type of split flap that slides backward along curved tracks that force the trailing edge downward, increasing chord and camber without affecting trim or requiring any additional mechanisms. It was invented by Arthur Gouge for Short Brothers in 1936 and used on the Short Empire and Sunderland flying boats, which used the very thick Shorts A.D.5 airfoil. Short Brothers may have been the only company to use this type. Drops down (becoming a Junkers Flap) before sliding aft and then rotating up or down. Fairey was one of the few exponents of this design, which was used on the Fairey Firefly and Fairey Barracuda. When in the extended position, it could be angled up (to a negative angle of incidence) so that the aircraft could be dived vertically without needing excessive trim changes. Commonly, but incorrectly, called the Zapp flap, it was invented by Edward F. Zaparka while he was with Berliner/Joyce and tested on a General Aircraft Corporation Aristocrat in 1932 and on other types periodically thereafter, but it saw little use on production aircraft other than on the Northrop P-61 Black Widow. The leading edge of the flap is mounted on a track, while a point at mid chord on the flap is connected via an arm to a pivot just above the track. When the flap's leading edge moves aft along the track, the triangle formed by the track, the shaft and the surface of the flap (fixed at the pivot) gets narrower and deeper, forcing the flap down. A hinged flap which folds out from under the wing's leading edge while not forming a part of the leading edge of the wing when retracted. This increases the camber and thickness of the wing, which in turn increases lift and drag. This is not the same as a leading edge droop flap, as that is formed from the entire leading edge. Invented by Werner Krüger in 1943 and evaluated in Goettingen, Krueger flaps are found on many modern swept wing airliners. A small fixed perpendicular tab of between 1 and 2% of the wing chord, mounted on the high pressure side of the trailing edge of an airfoil. It was named for racing car driver Dan Gurney who rediscovered it in 1971, and has since been used on some helicopters such as the Sikorsky S-76B to correct control problems without having to resort to a major redesign. It boosts the efficiency of even basic theoretical airfoils (made up of a triangle and a circle overlapped) to the equivalent of a conventional airfoil. The principle was discovered in the 1930s, but was rarely used and was then forgotten. Late marks of the Supermarine Spitfire used a bead on the trailing edge of the elevators, which functioned in a similar manner. The entire leading edge of the wing rotates downward, effectively increasing camber and also slightly reducing chord. Most commonly found on fighters with very thin wings unsuited to other leading edge high lift devices. A type of Boundary Layer Control System, blown flaps pass engine-generated air or exhaust over the flaps to increase lift beyond that attainable with mechanical flaps. 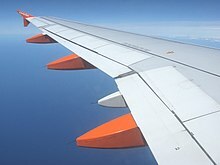 Types include the original (internally blown flap) which blows compressed air from the engine over the top of the flap, the externally blown flap, which blows engine exhaust over the upper and lower surfaces of the flap, and upper surface blowing which blows engine exhaust over the top of the wing and flap. While testing was done in Britain and Germany before the Second World War, and flight trials started, the first production aircraft with blown flaps wasn't until the 1957 Lockheed T2V SeaStar. Upper Surface Blowing was used on the Boeing YC-14 in 1976. Also known as the FlexFoil. A modern interpretation of wing warping, internal mechanical actuators bend a lattice that changes the airfoil shape. It may have a flexible gap seal at the transition between fixed and flexible airfoils. A type of aircraft control surface that combines the functions of both flaps and ailerons. As of 2014, U.S. Army Research Laboratory (ARL) researchers at NASA’s Langley Research Center developed an active-flap design for helicopter rotor blades. The Continuous Trailing-Edge Flap (CTEF) uses components to change blade camber during flight, eliminating mechanical hinges in order to improve system reliability. Prototypes were constructed for wind-tunnel testing. A team from ARL completed a live-fire test of a rotor blade with individual blade control technology in January 2016. The live fire experiments explored the ballistic vulnerability of blade control technologies.Researchers fired three shots representative of typical ground fire on a 7-foot span, 10-inch chord rotor blade section with a 4-foot long CTEF at ARL's Airbase Experimental Facility. Leading edge slats and slots are mounted on the top of the wings' leading edge and while they may be either fixed or retractable, when deployed they provide a slot or gap under the slat to force air against the top of the wing, which is absent on a Krueger flap. They offer excellent lift and enhance controllability at low speeds. Leading edge slats allow the wing to fly at a higher angle of attack which decrease takeoff and landing distances. Other types of flaps may be equipped with one or more slots to increase their effectiveness, a typical setup on many modern airliners. These are known as slotted flaps as described above. Frederick Handley Page experimented with fore and aft slot designs in the 20s and 30s. Spoilers are intended to create drag and reduce lift by "spoiling" the airflow over the wing. A spoiler is much larger than a Gurney flap, and can be retracted. Spoilers are usually installed mid chord on the upper surface of the wing, but may also be installed on the lower surface of the wing as well. Air brakes are used to increase drag, allowing the aircraft to decelerate rapidly. When installed on the wings they differ from flaps and spoilers in that they are not intended to modify the lift and are built strongly enough to be deployed at much higher speeds. Ailerons are similar to flaps (and work the same way), but are intended to provide lateral control, rather than to change the lifting characteristics of both wings together, and so operate differentially - when an aileron on one wing increases the lift, the opposite aileron does not, and will often work to decrease lift. Plain flap at full deflection. Krueger flaps and triple-slotted trailing-edge flaps extended for landing on a Boeing 747. Junkers flaps, doubling as ailerons. Wikimedia Commons has media related to Trailing-edge flaps. ^ a b c Perkins, Courtland; Hage, Robert (1949). Airplane performance, stability and control, Chapter 2, John Wiley and Sons. ISBN 0-471-68046-X. ^ a b Cessna Aircraft Company. Cessna Model 172S Nav III. Revision 3 - 12, 2006, pp. 4-19 to 4-47. ^ Windrow 1965, p. 4. ^ Rudolph, Peter K. C. (September 1996). "High-Lift Systems on Commercial Subsonic Airliners" (PDF). NASA. p. 39. ^ Rudolph, Peter K. C. (September 1996). "High-Lift Systems on Commercial Subsonic Airliners" (PDF). NASA. p. 40, 54. ^ Reckzeh, Daniel (2004). "Aerodynamic Design of Airbus High-lift Wings in a Multidisciplinary Environment": 7. CiteSeerX 10.1.1.602.7484. ^ Gunston 2004, p. 452. ^ a b c Taylor 1974, pp. 8–9. ^ Toelle, Alan (2003). Windsock Datafile Special, Breguet 14. Hertfordshire, Great Britain: Albatros Productions. ISBN 978-1-902207-61-2. ^ Gunston 2004, p. 584. ^ Gunston 2004, p. 569. ^ Smith, Apollo M. O. (1975). "High-Lift Aerodynamics" (PDF). Journal of Aircraft. 12 (6): 518–523. doi:10.2514/3.59830. ISSN 0021-8669. Archived from the original (PDF) on 7 July 2011. Retrieved 12 July 2011. ^ Gunston 2004, p. 249–250. ^ National Aeronautics and Space Administration. Wind and Beyond: A Documentary Journey Into the History of Aerodynamics. ^ Gunston 2004, p. 331. ^ Gunston 2004, p. 270. ^ C.M. Poulsen, ed. (27 July 1933). ""The Aircraft Engineer - flight engineering section" Supplement to Flight". Flight Magazine. pp. 754a–d. ^ "Chapter 10: Technology of the Jet Airplane". www.hq.nasa.gov. ^ "Virginia Tech – Aerospace & Ocean Engineering". Archived from the original on 7 March 2007. ^ Gunston 2004, p. 335. ^ Clancy 1975, pp. 110–112. ^ Gunston 2004, p. 191. ^ Williams, J. (September 1954). "An Analysis of Aerodynamic Data on Blowing Over Trailing Edge Flaps for Increasing Lift" (PDF). NACA. p. 1. ^ "Shape-shifting flap takes flight". 17 November 2014. Retrieved 19 November 2014. ^ Technical Committees Present the Year in Review. Aerospace America. 2014. p. 15. ^ "Army researchers explore future rotorcraft technologies | U.S. Army Research Laboratory". www.arl.army.mil. Retrieved 10 July 2018. ^ "fig | slot opffh | pbar slot | 1921 | 0845 | Flight Archive". www.flightglobal.com. Retrieved 18 April 2019. Clancy, L.J. (1975). "6". Aerodynamics. London: Pitman Publishing Limited. ISBN 978-0-273-01120-0.